Sunday only AE allocation introduced. Sunday only AE allocation withdrawn. With the completion of the new bridge at Mill Hill Broadway the terminal changed to new stand at MILL HILL BROADWAY STATION. Monday-Friday school journeys extended from Page Street to East Station. HD allocation converted from RT to RM. Converted to One Man Operation and diverted via withdrawn 114 to Harrow Weald. 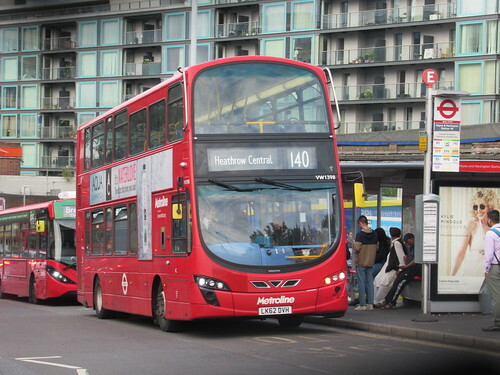 Sunday extended from Harrow Weald to Edgware via withdrawn Sunday 286. 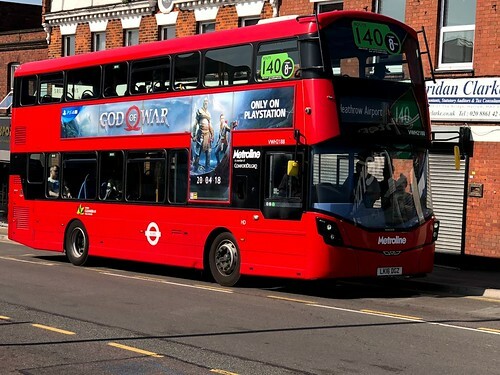 Extended daily from Harrow Weald to Edgware via withdrawn 286. Extended from Heathrow Central to Terminal 4. Sunday journeys via Cherry Lane withdrawn. TA type transferred to Potters Bar for new contract 263 - replaced by new TPL type. The 140 was a lovely Road - with nice early finishes and no desperately bad spreadovers. No 1 used book on 0522 and finish in the garage at 1007 but No 2 was even better with SO at 0532 and 0935 in the garage. Not quite as good as the first duty at Colindale which used to SO at 0412 and finish outside depot at 0832 - all 666s that was. Those were the days of the eleven day fortnight where we worked six days one week and five days the next and half a day's pay was taken from the six day pay packet to even up the pay on the five day week. Duties and the pay week used to change on a Wednesday then and every three or four weeks you would get a Tue/Wed/Thu rest which was handy if - like me - you liked your cricket as it meant I could get to all five days of the test matches at Lords and the Oval - either by way of rest days or early finishes. We fought hard to get a five day week and even then it took until 1966 and an overtime ban. Once we got it the week changed from Wed change over to Sat change over so your long weekend rest days became Thu/Fri/Sat/Sun about every three or four weeks.